HTML Sitemap is an important page of a website. It is significantly improved version than default WordPress StudioPress Genesis supplied archive template. Here is a Free WordPress Genesis HTML Sitemap With Responsive Column PHP Template For the Genesis Users. Simply you need to drop it via FTP & select as template from WordPress Post editor. We have removed the odd stuffs of default StudioPress Genesis archive pages towards bottom like Author-named archive, added RSS Feed, added responsive CSS columns for monthly archives and pages, added horizontal lines etc. On full desktop browser, you’ll see three columns, on browsers lesser than 1139px, you’ll see two columns, on browsers lesser than 480px, you’ll see one column. We talked about CSS Columns, it is CSS which is automatically breaking the list in to nice columns. Very old browsers may not support. How To Use WordPress Genesis HTML Sitemap? Easy. If your child theme’s name is Metro, and the path is wp-content/themes/metro. Then go to that location via FTP or SSH. We are supplying you a PHP file named page_archive.php. List the files and make sure that another custom file is not in place, if such present, rename that. We have a full GitHub repo for that WordPress Genesis HTML Sitemap. Download only the page_archive.php as RAW text and save as page_archive.php. Basic questions are answered on that repo. Then, from WordPress administration backend, create a Page named archive or sitemap, choose Sitemap as template from WordPress Editor’s Page Attributes > Template > [Dropdown] > Sitemap. Save the page and publish it. Thats it. In Github repo, basics on how to edit is written. 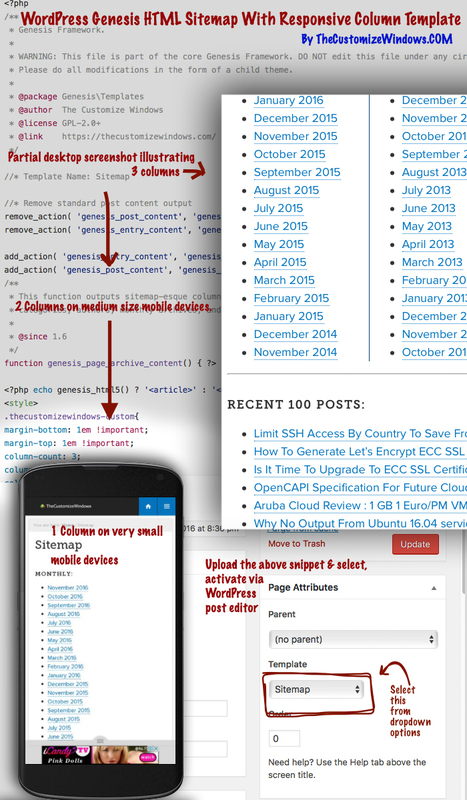 Cite this article as: Abhishek Ghosh, "WordPress Genesis HTML Sitemap With Responsive Columns," in The Customize Windows, November 21, 2016, April 21, 2019, https://thecustomizewindows.com/2016/11/wordpress-genesis-html-sitemap-responsive-columns/.